Nothing like waking up in the morning and having a nice hot cup of tea with your breakfast. It is part of my morning routine each and every day. I usually drink green tea daily, so when I was asked to review Choice Organic Black Tea I was quite excited to try something new and taste something different, than my same old green tea routine. I chose to drink this tea with milk and sugar. The taste is amazing! Very smooth and calming. I also tried a cup with no milk and sugar and I was pleased to enjoy the flavor on its own. The caffeine level is about half of the amount of caffeine that is in an 8 ounce cup of coffee. The origin of this tea is from India and Sri Lanka. Brewing instructions for hot tea are, boil fresh water, steep in an 8 ounce cup of water for 4 to 5 minutes and enjoy! I add milk and sugar, but I’m sure honey, lemon, or flavored creamers can be used as well. For brewing iced tea, brew double strength, two tea bags to every 8 ounces of water. I did about 32 ounces of water and added sugar and ice cubes. It was absolutely refreshing and now I am hooked! Touch up glass of iced tea with a slice of lemon and you have perfection! 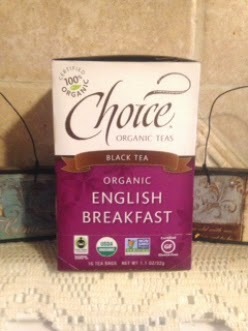 Choice Organic Teas are the first exclusively organic tea crafters in the United States since 1989. And later on hey are the first to offer Fair Trade Certified Tea, the world’s finest teas with conservation of the planet and its creatures in mind. Some benefits of drinking black tea are, oral health, a better heart, antioxidants, cancer prevention, healthy bones, lowers risk of diabetes, stress relief, a better immune system, a healthy digestive tract, increased energy, and a happiness factor. Now who wouldn’t want all that! For more information on Choice Organic Teas online or for more information about Fair Trade Certified products. I am a tea drinker, although I make iced tea more than hot tea, even during cold weather. I have heard of Choice,but have not yet bought it. I usually make my tea with both lack and green varieties.